Chocolate rum balls are a fun and festive dessert, as well as a great hostess gift at holiday time or a special Valentine treat. These truffle-like dense cake balls are flavored with chocolate and a kick of rum (so keep the kiddos away!). Besides being delicious, they are also portion-controlled, quick to make (you can whip these treats up in 5 minutes), gluten-free, and sugar-free. Vary the amount liquor to your taste—just keep in mind that if you cut down, you need to replace the rest of the alcohol measurement with water or sugar-free flavored syrup. 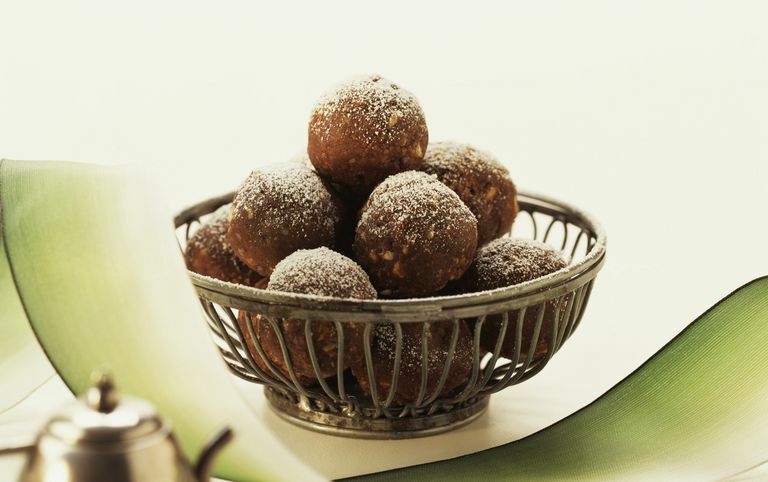 You can also try this recipe with bourbon or brandy if you prefer, and if you'd like, you can roll the balls in powdered sugar and/or cocoa powder. One of the most important facts about these chocolate rum balls is that they taste better the day after they are prepared—they need several hours for the flavors to mesh well and the alcohol to mellow. Make sure to plan ahead of time so you are not caught the day of trying to make them work. Mix almond flour, cocoa powder, and powdered erythritol together in a bowl. Add softened butter and mix to combine well. Add vanilla and liquor and mix well. Roll mixture into golf-ball-sized balls and place on a cookie sheet or platter. Let them sit for a day or so for the flavors to mellow. Store in covered container in the refrigerator or a cool place. Erythritol may seem like a special ingredient but it is gaining in popularity. Some stores are starting to carry powdered sugar alcohols so you may be able to find it in your supermarket or natural food store, or you can order online. Erythritol is the sugar alcohol with the least blood sugar impact, but you can use others such as xylitol. If the erythritol you use isn't powdered, it won't dissolve much in this recipe. You will need to run it through a blender first.